Shenstone | I HATE HATE!!! Protest at Israeli drone factory in Birmingham planned for July 2015 – everyone welcome! 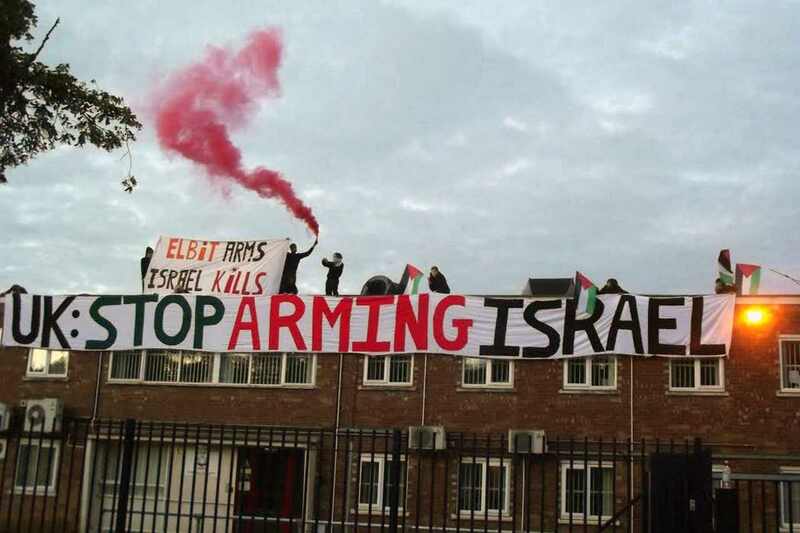 Last year, news of the Israeli attacks on Gaza led to demonstrations such as nine activists who occupied the roof of he UAV Engines Ltd factory in Shenstone, near Birminham, which is owned by the Israeli arms company Elbit Systems. They shut down the drone engine factory for two days costing the company more than £180,000. Rooftop protest at Elbit Systems last year. This year’s planned even will be far more peaceful and suitable for all the family. This year, on 6 July (the anniversary of the start of the onslaught on Gaza), a more organized demonstration at Shenstone is planned. “Block the Factory” will “be transforming the space around the arms factory, converting it from a site of destruction into a fun, creative and child-friendly environment”. Elbit Systems makes engines for drones, surveillance equipment for the militarized USA/Mexico border and the Israeli Separation Wall, which breaches international law and stretches for hundreds of miles, dividing families and confiscating large swathes of fertile Palestinian land as it goes. Elbit Systems is just one part of the massive arms industry that makes Israel the largest per capita arms exporter in the world. Israel is the world’s second largest exporter of military drones, selling thousands all over the world. And who makes the engines for the drones? UAV Engines Ltd, whose factory is in Shenstone, near Birmingham. ‘Block the factory’ aims to turn the space around the factory into a fun, creative and inspiring place, rather than one associated with death, destruction, and injustice. Whether it’s by telling stories or holding workshops, making art or flying kites (not drones), playing music or sharing food together, it will be a space for activists to build support networks, find new allies and make new friends. The organisers want to make this an inclusive and family friendly affair, believing that diversity makes us better and stronger. So, whether you have never been on a protest before or are a seasoned activist, whether you are disabled, an older person, a younger person, whether you have five children or none, you are encouraged to come and help make this the biggest, most beautiful action yet at an arms factory in the UK. Better still, there are ways to get yourself or your group actively involved. That could be running a workshop or a creative space, playing music or organising food, or even creating an activity session for children. The organisers stress that the action is what people make it, and welcome ideas and input. Shenstone is a small village outside Birmingham, accessible by National Rail trains. If you are coming from outside Birmingham, this generally means travelling to Birmingham New Street and changing there. Trains run roughly every 20 minutes from Birmingham New Street, and tickets cost around £4.50. Earliest trains are at 06:01 and the last train returning to Birmingham is at 23:32. British Muslim teacher removed from US-bound plane... in Iceland! "All people are scum. No matter what they look like."